Not even the Orkin Man can exterminate a bug this big. 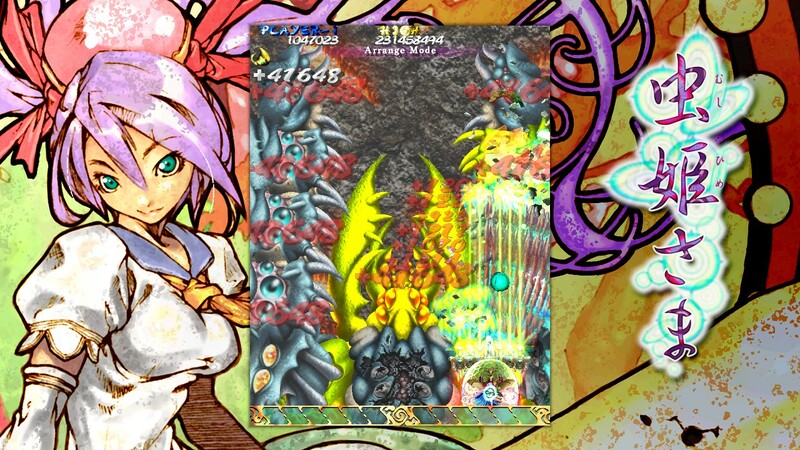 Cave has finally made its shmup debut on Steam, and publisher Degica chose quite a devil of a game to make its grand entrance, the classic shmup Mushihimesama. I’d read about just how difficult this shmup was before playing, and speaking from experience, its reputation of being one of the most brutal, punishing bullet hell games out there is well earned. Unlike most shmups you’d find, this one is a bit different, opting for a fantasy setting rather than your typical sci-fi space or military sortie. Mushihimesama (“Bug Princess”) refers to the main character Reco, who is a sort of bug whisperer — she rides on her golden beetle to save her village from a terrible miasma that’s dangerous to humans produced by giant insects. And that’s where you, the player, comes in, spraying more bullets against giant bugs than a viewing of Starship Troopers. Mushihimesama is over 11 years old by now, but Degica has done a pretty good job of porting it to Steam. You have your original and arrange modes, as well as a novice and training mode you can use to build up your skills. The score attack mode lets your compete with your friends to see who can get the highest score, and there are also leaderboards so you can further boast about your bug destroying ability. There’s also a variety of overlay options you can use to customize the experience, rotate the screen, and play in different aspect ratios (the lack of an actual resolution option is a minor annoyance, however). Finally, it supports controller input right from the get go, which is nice. When I say this is a Bullet Hell, I mean it. Mushihimesama has no mercy. As for the actual game, Mushihimesama plays like a top-down vertical shooter where the enemies come pouring in from above. Bugs great and small litter the screen with lots of purple projectiles, and the action starts out slow but gets pretty hectic before too long. On Maniac and higher difficulties, even early bosses are very threatening, as bullets bloom and burst into beautiful, almost floral like patterns. If you’re too awestruck to pay attention to where Reco is, you’re going to die. In fact, you’re probably going to die anyway, and a lot. 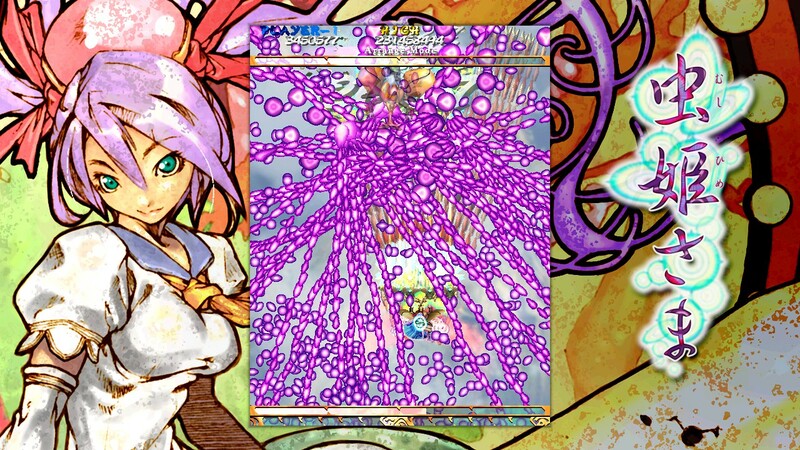 Even if you were to play in the easiest difficulty, Mushihimesama does not take it easy on you. You can get a brief respite by using a ‘shield’ that makes all the bullets disappear from the screen and drops a bomb on your enemy, but it’ll only take them a moment or two to fire another barrage at you from which there is only a slim chance at escape. Thankfully, you do have infinite continues, but this of course comes at the price of resetting your score to zero. You’d best start practicing if you want to keep those digits! Mushihimesama looks pretty good, considering how old it is. The environmental and creature graphics hold up well, boss insects look truly menacing, and it’s bright and colorful. There is some noticeable slowdown when the action gets too intense, (and unfortunately that does not help one bit when you’re frantically trying to dodge shots) but otherwise it’s a beautiful sight. The music by Manabu Namiki and Masaharu Iwata is lovely. They put together an energetic, yet sometimes soothing synth-packed soundtrack that’s oddly comforting when you’re doing your best not to throw your controller in rage at the sheer brutality of it all. Think you have enough firepower to take down some giant bugs? 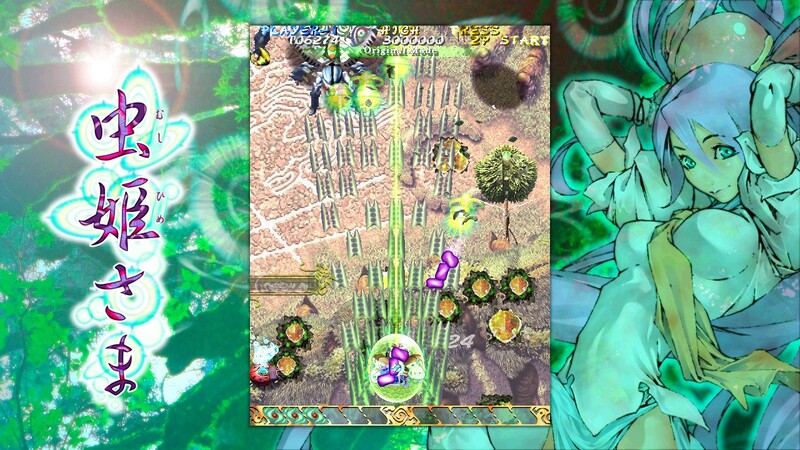 At its price of $19.99, Mushihimesama is a solid buy on Steam for those looking for the very best in the bullet hell/shmup genre. I’d say it should be the set standard for publishers looking to port old shmup arcade releases to the platform. If you don’t mind the difficulty, you’ll be playing through those 15-20 minute sessions over and over until you’re not dying so much.